In 1976, a New York-based group calling themselves Artists Meeting for Cultural Change distributed posters with the headline ‘ARTISTS UNITE!’. They were protesting against the selection of artists in an exhibition titled ‘Three Centuries of American Art’; ‘STOP RACISM & SEXISM’ the poster demanded. Why is it so hard to imagine artists galvanising themselves into equivalently forthright activism today? Not only have most contemporary artists lost faith in the potential of art to effect social or political change, a significant number are actually responding to our current moment by deliberately increasing the total sum of human misery. Cruelty, it seems, has become an artistic position. How exactly did this come about? You don’t need me to explain to you why the past decade has, as far as global politics is concerned, been the most cataclysmic and pivotal era since the 1960s. Nevertheless, for most of us in the English-speaking West, life goes on more or less as usual, despite a lurking sense that the ground is beginning to crack and slide beneath our feet. We are aware of being in the middle of something that we can feel but still cannot wholly see. How can artists today be expected to actively respond to a state of affairs that is hard to circumscribe, let alone wrestle into submission? The representation of political realities did not always seem such a problematic activity. An exhibition currently on display at the Getty Center in Los Angeles is titled ‘Engaged Observers: Documentary Photography since the Sixties’. It includes powerful bodies of work including Philip Jones Griffiths’ famous images of the Vietnam War, Susan Meiselas’s reportage from Nicaragua in the late 1970s, Sebastiao Salgado’s photographs of migrant populations as well as James Nachtwey’s searing records of injured American soldiers in Iraq. What these images share is an attitude of righteous outrage at the injustices that they are representing; they are ‘engaged’ because of their criticality, which manifests itself through the identification of victims and, sometimes explicitly and sometimes by implication, their oppressors. What these images also share is the ability to isolate problems and to place them ‘over there’, on the far side of the room, in a picture frame or in the printed pages of a magazine. Despite these photographers’ doubtless immersion in the situations they were documenting, rarely is this acknowledged in the work and nowhere is the possibility even considered that the photographer might be implicated in, still less responsible for, the events he or she portrays. How, for instance, would the presence of a photographer influence the behaviour of a squadron of soldiers going into battle? In the minds of these photographers, ‘engagement’, it seems, has clear limits. Photojournalism is not the same as visual art, but neither can it be considered in isolation, especially when we view it in museums and galleries rather than in news media. It has informed, both through style and methodology, a vast amount of recent art, much of which finds a platform on the biennial circuit, where demands on imported artists for political and/or contextual ‘engagement’ (note the flexibility of this term) are often the most acute. Curator Okwui Enwezor’s Documenta 11, held in Kassel in 2002, marked something of a high tide in this regard, featuring hours of documentary video by artist-filmmakers such as Kutlug Ataman, Alfredo Jaar, Isaac Julien and Shirin Neshat. Photojournalism’s assimilation by visual art however is not limited to film and photography; an artist such as Thomas Hirschhorn, also included in Documenta 11, creates installations, sculptures, collages and participatory environments that deploy reams of mass-media imagery within a critical commentary on the mechanics of the industry that generates it. The criticism often levelled against Hirschhorn, amongst others, is that by using imagery in this way he intends to rise above it. As critic Tirdad Zolghadr has pointed out, ‘an authorial persona is constructed that morally supersedes [this material], even extending the offer of redemption to the museum audience itself.’1 Hirschhorn, like the photographers in ‘Engaged Observers’, places himself – and so, by extension, his audience – outside of the circle of exploitation and violence that he critiques. A recent film by the Dutch artist Renzo Martens, currently on display as part of the Berlin Biennial, demonstrates this position to be untenable. Episode III (2009) – oddly, the second part of a trilogy – shows the foppish young Martens voyaging to The Democratic Republic of the Congo. There, he explains to villagers he meets that the only resource they have is their poverty, but that, on the plus side, the Western world has an insatiable appetite for this resource, which it consumes via the images delivered by its media. He tells them: ‘If poverty is like a gift that creates deeper understanding, you also give it back to the world. […] It’s something that makes us happy, in a way.’ Martens proposes that the Congolese make their own photographs of their suffering. Working for Western news agencies, they might make a thousand times what they earn by taking their usual pictures of weddings and parties. 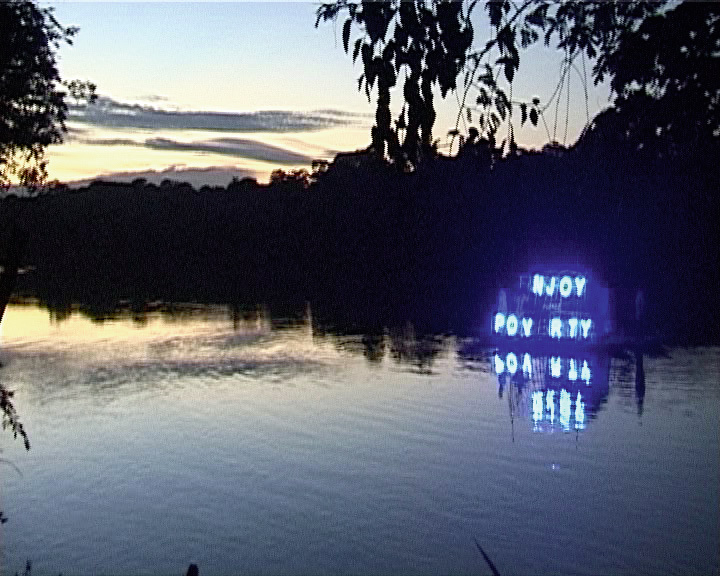 He erects a neon sign at the village, which proclaims ‘ENJOY POVERTY’. The sign is in English, he explains to them, because it is intended to be read by the visitors to European art galleries rather than the villagers themselves. What extends Martens’ project, however, beyond Swiftean irony is the artist’s eagerness to place himself at every opportunity in front of the camera lens, even as he behaves in the most insensitive and cruel manner. At one point, as gazes into the camera lens singing a Neil Young song while, in the distance, two men can be seen carrying his heavy metal trunks on their heads. Martens’ narcissism is half genuine (the artist’s honest self-revelation) and half put-on (in provocation). Martens might well have read Slavoj Zizek’s book Violence, published a year before he made his film: Zizek uses the Congo as a prime example of an underreported crisis situation that is virtually ignored in the global media. His plea is for us to divert our attention from ‘subjective violence’ – that is, violence performed by an identifiable perpetrator – to the objective forms of ‘systemic’ violence and ‘symbolic’ violence, which quietly reinforce themselves just as the ‘left-liberal humanitarian discourse on violence’ attempts to erode the former. The sane thing to do, says Zizek, is precisely nothing; we should wait and see, and in the meantime, ‘learn, learn and learn’.2 Jacques Rancière too has repeatedly argued that art is helpless in effecting political change, primarily because the political significance of an art work is so unstable and dependent on the temporal conditions of its reception. Martens’ ostentatious refusal to interfere, unlike the critical (but equally hands-off) position taken by Hirschhorn, refuses to let us off the hook. Zizek, in his rejection of humanitarian pity as a route to justice, is in agreement with Susan Sontag who, in Regarding the Pain of Others, wrote that ‘So far as we feel sympathy, we feel we are not accomplices to what caused the suffering.’3 It is not only Martens who has emphasised the moral implication that looking entails. Polish artist Artur Zmijewski’s film 80064 (2004) shows the artist persuading an elderly Holocaust survivor to have his faded concentration camp tattoo renewed; Zmijewski demonstrates that remembrance and repetition are not easily disentwined. Since the late 1990s, the godfather of the ‘radical cruelty’ genre, Santiago Sierra, has paid workers small sums of money to perform in his art works – in one memorable case he paid four prostitutes the price of a bag of heroin in exchange for having lines tattooed on their backs.4 More recently, Adel Abdessemed caused controversy with the film Usine (Factory, 2008), showing various animals confined and fighting in a room together; another work, Don’t Trust Me (2008), in which six animals were slaughtered with a hammer blow to the cranium, was pulled at the last minute from an exhibition at the San Francisco Art Institute due to public outcry before it had even been screened. Although it was the animal rights movement that was most exercised by the videos, it was clear to most that they weren’t really about animals at all. While we may kid ourselves that it is compassion that motivates our frequently powerful responses to such work, I’d argue that such responses should in fact be attributed to the public’s immediate understanding that these actions are taking place on its account. ‘Not in my name!’ people cry. If one was to criticise Abdessemed, it might be on the grounds that by prompting such humanitarian ire over subjective violence, the other strata of implied systemic and symbolic forms of violence are too easy to overlook. In Episode III, Martens’ preening tactlessness, combined with the puzzlement of his subjects, places us in the frame with them both, wanting to intervene, or explain, or make the situation right somehow. And then not knowing where to begin.